No matter how beautiful the renderings, and entrancing the visions, and clever the concepts, there were two worms in the apple. Those are the intractable dilemmas that make the transformation of downtown Hicksville challenging. 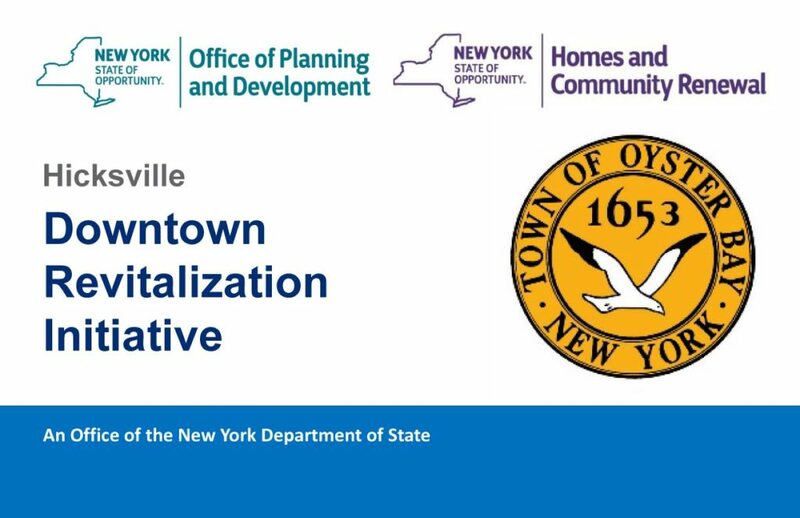 The Hicksville Downtown Revitalization Initiative’s (DRI) Local Planning Committee (LPC) held its third public meeting on Jan. 18. 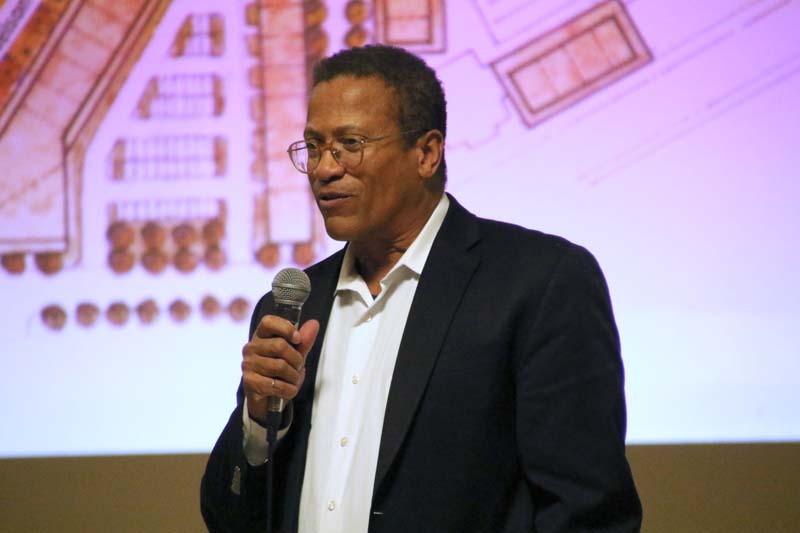 Dozens of attendees filled the Hicksville Community Center to hear the latest plans for how the hamlet will spend the $10 million grant it won last year as part of the state’s DRI program. 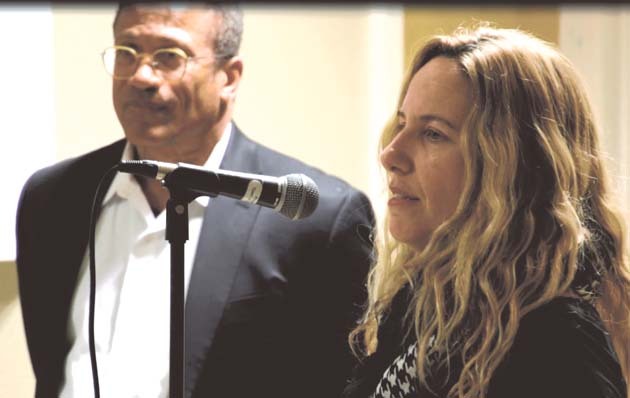 Many of the public comments dealt with traffic and parking issues, and it was evident that there were no easy answers. Erik Wood and Cecil Bakalor of the NYC-based HKS architecture and design firm led the presentation. The firm received kudos from LPC members and the public alike for the renderings of possible projects in the downtown, focused on the train station area. The multinational firm has designed three NFL stadiums and has a portfolio of high-priced projects. A tabletop low relief three-dimensional model was the focus of much attention and comment. Oyster Bay Supervisor Joseph Saladino, however, pointed out that it was a very preliminary rendering, and much could change. Click the image to look through the 72-slide presentation shown at the meeting. Many of the LPC members had served on the Downtown Hicksville Revitalization Committee (DHRC). A number of the ideas from that committee’s final plan have been incorporated into the visions that HKS presented. 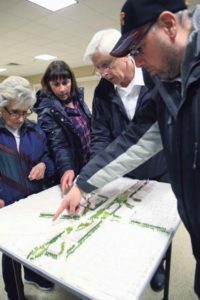 The project has a number of moving parts, and must mesh aims and aspirations that, it was obvious from public comment at the meeting, could conflict with each other. The Metropolitan Transportation Authority (MTA) is spending $121 million to refurbish the train station, the busiest in the LIRR system outside New York City. The MTA is also planning to erect a parking garage to help address the parking shortage. The Town of Oyster Bay will need to change its zoning to comply with the vision of transforming its downtown. And Nassau County is reportedly undertaking a traffic study encompassing the area bordered by the DRI and even beyond. Seen from the air, much of downtown Hicksville is covered by surface parking lots, mainly used by commuters. They are full during weekdays and empty in the evenings. Consolidating these lots into what the DHRC’s final report called “structured parking would free up land for development that can enhance, rather than detract from the surrounding community.” It noted that many downtown businesses don’t have enough parking during business hours, and introduced ideas of how shoppers, commuters and patrons of restaurants/bars in the evenings could share parking. 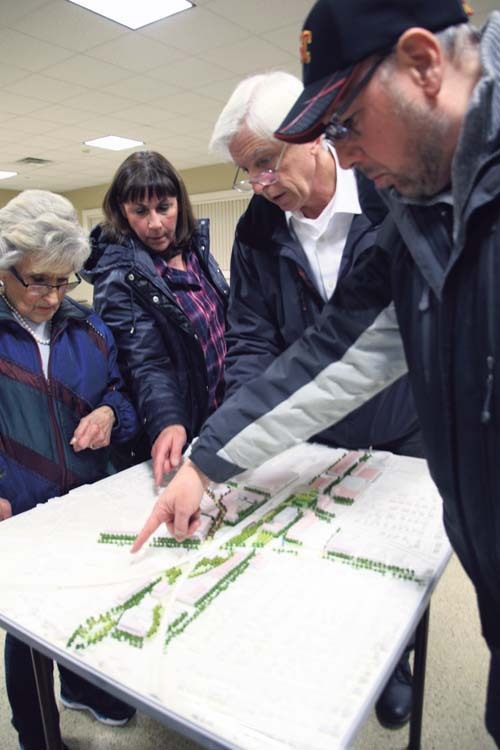 Residents gather around a three-dimensional model of the area encompassed by the Hicksville Downtown Revitalization Initiative. 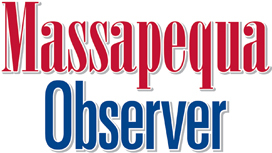 James McCaffrey, deputy commissioner of economic development for Oyster Bay, said that the town reached out to property or business owners interested in locating in the DRI. 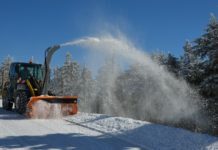 “There is a limited amount of funding, so as a committee, one of your jobs is to select the best projects that are economically viable and can happen in the next 18-24 months,” he stated, adding that the projects would also need to benefit the larger community. Words of hope came from co-chair Kapell, the former mayor of Greenport. One of his goals in that North Fork community was to build a public park along the harbor. “We had no idea how to go about it and it took 13 years to do it,” he confessed. Eventually, Greenport tapped 28 different funding sources to build Mitchell Park and Marina. Kapell went on to say this same synergy could do the same thing for Hicksville. A boutique hotel on West Cherry Street, between Broadway and Jerusalem Avenue. It would be about 15,000 square feet and have an estimated cost of $15 million. A mixed-use development under the name 99 Hicksville Station Plaza. Proposal for 200 apartments above ground-level retail. Would be erected on Newbridge Road and has an estimated price tag of $20 million. The principals asked for $1.5 million of DRI funding to begin the building task. Oyster Bay Brewery: Would move from its present location in the hamlet of Oyster Bay. Owners propose to spend $1 million, but as of yet do not have access to a property. Trinity Lutheran Church and School. Would expand day care at its current location on West Nicholai Street. Mass Transit Training Facility: Proposed by Nassau County BOCES to train people for positions in mass transportation. Proposed in the West Barclay Street area. Oxygen Therapy Center: A proposed facility of 10,000 square feet dependent on property acquisition. Principals propose to spend $800,00 and are requesting $400,000 from DRI grant. Residential Expansion: Proposal to expand a current 88-unit residential buildings on Broadway. Predicated on buying property on Williams Street. Developers plan to spend $14,7 million. Digital Ballpark: A non-profit is looking to for 10,000-square-foot site to create a space that would have tech-based start-ups and support for aspiring entrepreneurs. All of the $5000,000 cost would come from the DRI funds. 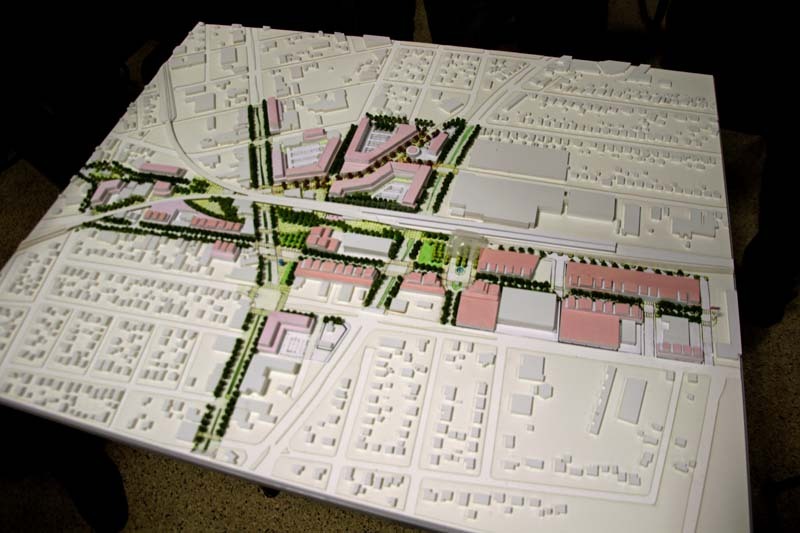 A view of the model, with proposed new buildings in light pink. For both Wood and Bakalor, “decongesting the area” encompassed by the DRI, especially around the train station, was one of the chief aims of their planning focus. The plan calls for buildings that combine retail, commercial and housing, with integrated parking. Walkable areas will figure prominently among the million square feet of development. A series of plazas will be crowned by the expansion of John F. Kennedy Memorial Park from its current .75 acres to 4 acres. These will create the possibilities for festivals and farmers’ markets and other public gatherings. “What you need to revive downtown Hicksville is coverage, a lot of development,” Bakalor observed. The HKS plan envisioned the West Barclay Street area as a destination, with active sidewalks, shops and restaurants and plenty of pedestrians. “It would be improved by putting trees, by putting landscaping and by putting lighting,” Bakalor said. The widening of Broadway (Route 107) and Newbridge Road (Route 106) by the state in the 1960s essentially killed the walkable, downtown character of the hamlet, people noted. The DRI vision called for these roads to become more pedestrian friendly. The plan envisions matching what Bakalor calls the existing, historical stores on the east side of the route with four-story buildings on the west side. These new buildings would have retail on the first floor, commercial or start-up firms on the second floor, and two floors of residential housing. Bakalor showed slides of other municipalities that in his view proved that successful “main streets” were built up on both sides. One of the key portions of the HKS plan is a series of public spaces that will supplant current drop-off points, as well as the forementioned expansion of JFK Park. The slides tabbed them as Station Plaza and Festival Plaza. The plan calls for changing the perception of JFK Park “from being a median to being an occupiable and effective gathering place for community events many people have mentioned that they would like to see happen here” according to Wood. John Sarcone, an LPC member, thought the reimagined JFK Plaza would help define the downtown. Town of Oyster bay Councilman and LPC member Tony Macagnone liked the idea of the nucleus of public spaces anchored by JFK Plaza. “Let’s get started and let’s give residents something they could have and enjoy,” he stated. Echoing Wood, Bakalor felt that it would appeal to the [LPC] as to where to make the first move, and start spending the grant money. “It would be a place to do events such as farmers’ markets, and as housing starts to be built, it will be a place that people can use as an amenity,” Bakalor said. Another area of attraction was Nelson Avenue, which starts at Broadway and makes its way south, paralleling Newbridge Road until it ends at Cherry Street. Bakalor loved the bend in the road, saying—as he showed slides of similar streets—that it had the potential for exciting visual possibilities. HKS also saw potential in West Barclay Street. The private sector will also be more engaged if thew town comes through with favorable zoning changes and density controls. LPC member and Nassau County Legislator Rose Marie Walker was impressed by the variety of projects interested in the DRI. Lionel Chitty, former president of the Chamber of Commerce and chair of the Downtown Revitalization Committee that had been studying the problems, wondered if the time frame within which the DRI operates would preclude potential businesses from applying for a share of the grant money. He was told that there would be opportunities. 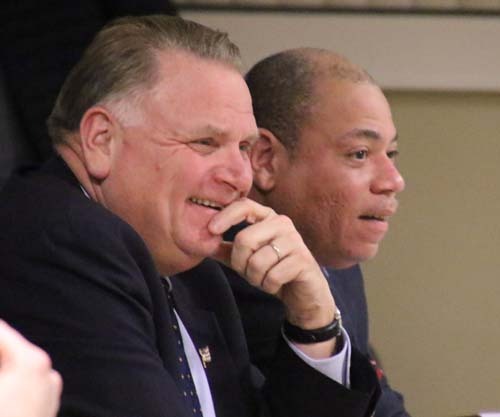 Town of Oyster Bay Councilman Anthony Macagnone (left) and former Hicksville Chamber of Commerce President Lionel Chitty share a light moment during the Jan. 18 meeting of the Local Planning Committee, of which they are members. That is why he was so supportive of the DRI. Linda Armyn said it was important to pay attention to Nelson Avenue because it was to be the center of the desirable mixed use. Erik Wood of HKS, an urban design firm and project consultant, was one of the moderators. John Budnick of Massapequa said he remained “interested conceptually in the Hicksville area,” where he was a former community activist. He spent years in the District Attorney’s office, dealing with crimes in the area in focus. He urged that the LPC try to get some kind of police presence in the vicinity of the train station. He also felt a hotel should be a high priority there. Eileen Supran of Plainview put the parking problems front and center, and asked Wood if the shortage of parking was being studied or addressed. Yes, was the answer, and later, McCaffrey stepped up to say the MTA would be building a garage on top of an existing parking lot that would add a net 900 spaces. Supran spoke of the housing developments in Plainview, as well as Hicksville and surrounding areas. A lot of millennial with cars would be flooding the area, she noted. Many would be frequenting the Hicksville train station. She suggested the old Cerro Wire site as a place where a parking lot could be put up. Her parting suggestion was for people to avoid that FedEx office. Rich Pfeifer said he’s been a resident since 1953 “and I’m tired of people dumping on Hicksville,” he said bluntly, calling for a moratorium on building parking spaces. Wood admitted he had no answers when Pfeifer asked him where the construction equipment would be stored when all the potential construction began. 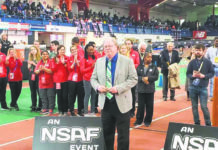 “The program is focused on what intervention could take place in the near term that would enable Hicksville to reach toward its vision,” Wood said after the last public speaker. “None of the things we have shown today have gone down to that level of detail to resolve the issues that some of the people have mentioned. What we’ve been able to do is think through a series of steps which we believe as private developers come forward on the property they own, that the parking can work in tandem with that development. The parking lots that the town currently owns can be increased. As for traffic, he said it would have to wait on the ongoing traffic study. 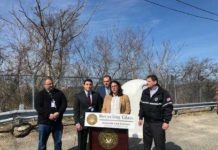 Eric Alexander of Vision Long Island has been involved with helping to plan a number of downtowns and was part of the Hicksville Downtown Revitalization Committee. 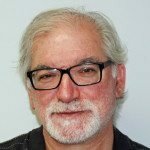 “You talk to Hicksville residents and business owners and you see consensus for three- or four-story buildings, public spaces and walkability. Everybody wanted that from day one,” he told Anton Media Group. Alexander said he had been a two meetings in Hicksville attended by hundreds of people. A vast majority favored changing the zoning in the downtown area to match the vision of a revitalized Huntington.